As a player, Daren Hart may be best known by the moniker “Twin.” The name Hart has, in just a short time frame, become synonymous with toughness, dedication, and overachievement — all good things, as both he and his brother David aptly demonstrated. 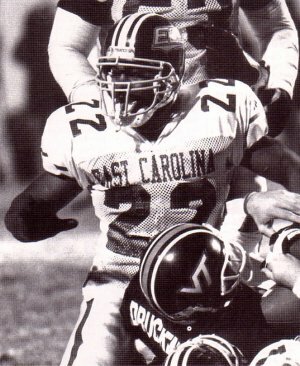 For East Carolina fans, who fondly recall the hard-nosed exploits of the brothers from Winston-Salem, the contributions the Hart twins made to the fabric of Pirate football need no elaboration. But to discover each as an individual reveals a new set of terms by which to define them. For Daren Hart, the taller one as he likes to point out, those words might be soft-spoken, fair, diligent, involved, determined, attentive, discerning, and the list goes on. The terms read like a recipe, and to an extent they are. They are the makings of what looks to be a sure bet for a career collegiate football coach. Today, Daren Hart, at 27 years old, is in his fourth year of coaching and his second at North Carolina Agricultural and Technical State University in Greensboro — currently ranked 19th in the nation. He is the defensive backs position coach and loves every minute of the small bucks, long hours post. “I started a career at First Union in banking,” Hart said. “I got lost there. I was having a sort of a withdrawal of not being part of a football team. I had to get out, so I went into teaching and coaching at West Charlotte (high school) and was part of a team again. His draw to coaching hits on all of those things that endeared him to the Pirate faithful as a player. As a player, he was dependable, aggressive, and always well prepared. And as a coach, he is the same, driven by the notion that he was not big enough, not fast enough to play big-time college football and that he can use his experiences and his ability to connect with kids and convince them they can be more then they ever dreamed as players. Hart’s principal assets were a whole lot of heart and a willingness to put in hours of preparation. “First, I tell them to trust your instincts,” he said. “That’s one thing I did as a freshman. Young guys are afraid to make mistakes. It’s not like they can’t play — they just don’t trust their instincts. When you trust your instincts, you start to expect to make plays and it grows from there. For Hart, it was film study that was the equalizer on the field. His preparation was impeccable, allowing him to compensate for being a half-step slow and a few inches short. The extra homework showed, perhaps most glowingly, in Miami in 1996. The Pirates traveled down for the legendary Orange Bowl and pounded the Hurricanes, becoming one of just three teams to beat Miami at home in a decade. 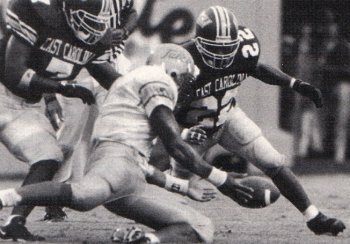 It was a one-side battle no ECU fan will soon forget and Hart had a major influence on the outcome — he had an interception, a sack, a fumble recovery and a forced fumble in a game that he considers maybe his best-ever. Hart hovers over Virginia Tech quarterback Jim Druckenmiller. As exciting as it was for him as a player, his biggest Miami memory might very well reveal that he was destined to be a coach. “You know, a bunch of us went to the Miami game when they (ECU and Miami) played in Raleigh,” he said, referring to the game two years ago. “Me, my brother, Scott Richards, Larry Shannon, a bunch of us were there and Miami was up big at halftime. To coach, it seems, is the right place for Hart. On the field, his method is to be a players’ coach. “My philosophy is to be aggressive and, for the most part, the kids are buying into it. They are getting there. You don’t want to have to teach effort,” he said. “Good things happen to those who run to the ball. I want them to trust themselves and run to the ball. "My relationship with my players, from position players all the way down to the whole team, is to be a players' coach type. I am a young coach and can relate to these guys on a level that the other coaches can't. Perhaps — but maybe Hart is selling himself a little short. Maybe he’s forgetting the games when he was covering the likes of Antonio Freeman (Va. Tech) and Marvin Harrison (Syracuse) or getting the jump on Peyton Manning (Tenn.), Gus Frerotte (Tulsa), or Donovan McNabb (Syracuse). “OK,” he recollected. “I know they had great careers. I remember Antonio Freeman, he was our initiation to college football. And Marvin Harrison, he was good, though he didn’t like to get hit. Yeah, and I remember laying a good lick on Peyton and chasing McNabb around. To Hart, the football transcends the game itself. And as many coaches before him and many after have and will say, football is a microcosm of life. For Hart, it’s no different. Hart (22) and teammate Morris Foreman (7) pursue the ball against Tulsa. Though he is now Daren Hart, not “one of the Hart twins,” he and his brother David are still very dependent on one another. Only now, it is more emotional. And today, Daren Hart looks over the practice field at his own players, looking for the proper mix of talent, heart, and desire. Run to the ball…run to the ball and good things will happen. For Daren Hart, it sure is good to be back in the game again.